You Would Dream You'd Want To Pay £10 For Some Bin Bags, Would You? But You Will. We are lucky in our house, we have an open fire which gets pit on Christmas morning. We have an incinerator on hand to chuck in all the wrapping paper, plastic packaging and cardboard boxes as the spoils of Santa are urgently ripped open. Christmas means a LOT of extra waste, and not all of it fits in your black bin. Trips to the local dump aren't viable either, as they are closed over those celebratory weeks. Here is you're answer. 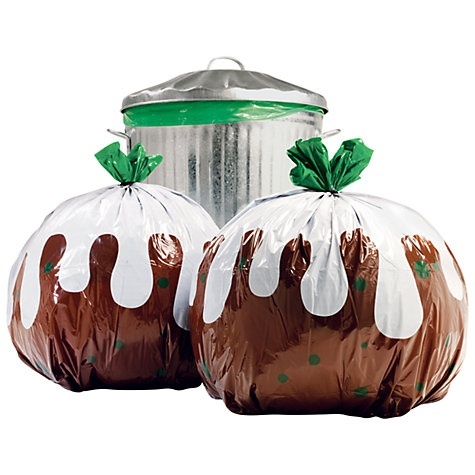 John Lewis have these Christmas Pudding Bin Bags, £10 for a pack of 12. 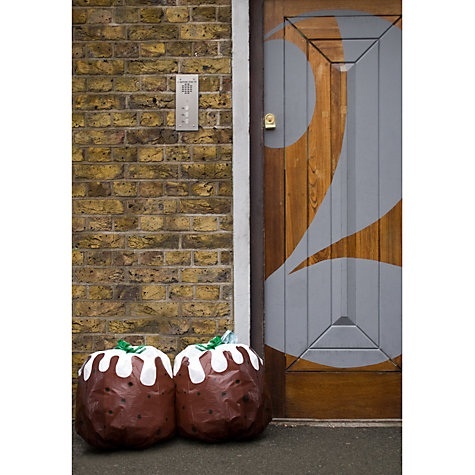 Not just for waste, you could equally use them as sacks for Santa to leave the boxes in on Christmas Eve. Also great if you are visiting in-laws and have a bundle of a dozen boxes to try to carry I to their house. You could even use them to decorate a huge outdoor tree, as waterproof tree baubles to match your outdoor lighting.